Okay, so we maybe, possibly found evidence that there have been Black-backed Woodpeckers hanging around Inkpot Lake this winter. Did we see anything else worth mentioning? Yes. Yes we did. 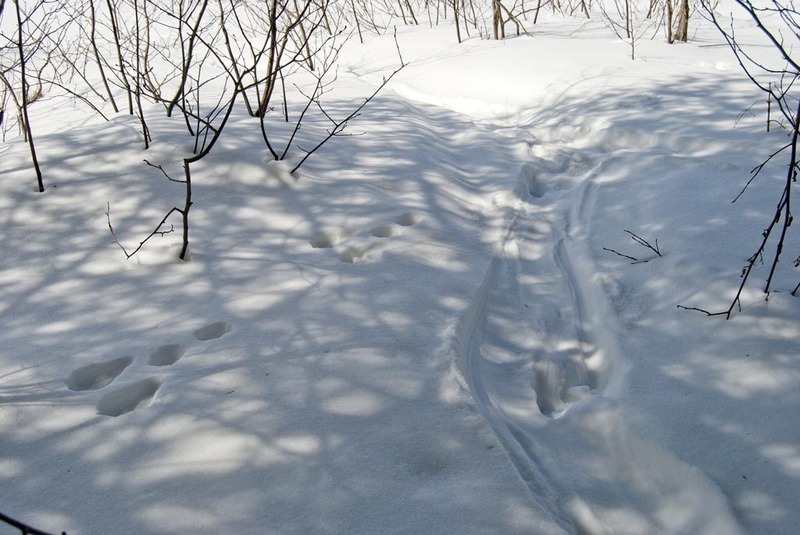 In February I wrote about a previous expedition to Inkpot Lake and included a photo of a tunnel in the snow that, judging by the tracks leading to it, had been made by an otter. 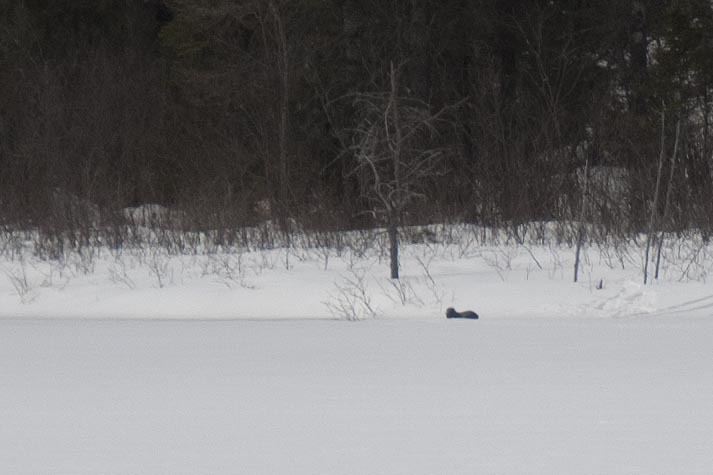 This time we found the edges of the lake heavily crisscrossed with more otter tracks and belly slides. Clearly this is a popular spot for them. Snowshoe hare tracks on the left, otter belly slide on the right. So, as we left the boggy area behind and worked our way back around the canoe launch, I kept pausing to examine every dark dot on the far side of the lake with my binoculars. I found a lot of stumps and bushes, but finally I found a dark dot that moved. Ready for a really terrible photo of an otter? Actually we counted three otters total, frolicking around on the opposite side of the lake from us. It was pretty great. After I commented “Wow, it’s a whole pile of otters,” Leanna wondered what the collective noun for otters really is, so I looked it up and according to Wikipedia one word that gets used is “romp.” A romp of otters! Perfect! We declared this adventure to be a huge success. Whoever things of a group of otters? We saw several swimming in the Tucson zoo…And now we can see a romp of otters. Very clever! And it’s not April Fools? Okay…it will make more sense if I spell THINKS correctly!